Christians have been using prayer beads for centuries as a tangible aid to their prayers, and a tool to help them enter contemplative space. In the process of encountering different Christian traditions, I became intrigued by the use of prayer beads, where they came from, and how they enhance spiritual life and practice. Part of the fruit of this research was a thirty page booklet, designed for use with Anglican prayer beads. It incorporates material from a variety of Christian prayer traditions, as well as the long-established traditional prayers of the Rosary (Catholic) and the Jesus Prayer (Orthodox). My approach to the prayer beads draws on a wide body of sources, but differs from all of them in approach and audience. I do not assume that my reader has any attachment to prayer bead traditions of any kind, and I work from the ground up, rooting the practice in Scripture and Christian tradition. The project, in its present incarnation, was written for the fairly specific purpose of producing a handful of sets of prayer beads as gifts at the end of last year. Nevertheless, I hope to revisit it in the future. Certainly this pamphlet can be revised, expanded, and adapted in a variety of ways. But I want to preserve the overall tone: it is simple, entry-level, and practical. You can download the pamphlet by clicking the image of the prayer bead booklet on the right. If you do take the time to read it, please leave a comment or send me an email. I would be interested in your perspectives on its continued development. 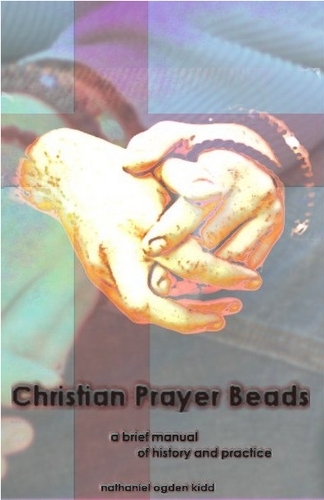 You may also be interested in this short guide I have written on how to make Christian prayer beads. Nathaniel - I've only read through your booklet briefly but I'll be reading it again much more thoroughly. My professional interest, jewelry, led me over the past year to a personal interest in the prayer beads of various traditions, because they are so like jewelry but are for such a different purpose than simple personal adornment. I was really pleased to come across your booklet this evening. It fills in many of the gaps in my understanding of Christian prayer beads. Your treatment of the different Christian traditions with balance and fairness is quite striking, as in your introduction to the Rosary - Christians all too often polarize over the points that you discuss. By the way, your good writing and overall presentation of the material was the icing. I'm trained as a technical writer and editor, and my former work was in science and engineering documentation - manuals. It's a way of thinking I'll never get away from. I can't tell you how cool it was for me to find a topic I'm so interested in laid out in a format like this. Your respect and love for the topic really show. May I print out the booklet to share with my mom? She and I were talking about this subject the other day when we were looking at a family heirloom rosary, and since she's nondenominational she felt she was missing a lot of the meaning. Suzanne, thank you for your kind and encouraging words. Please feel free to print the booklet and use it in any way you find helpful. You might also enjoy Basil Pennington's book on the Rosary entitled Praying by Hand. It's out of print now and a little hard to track down, but is a good resource on that particular tradition. I have more or less shelved this particular project while in India, although India probably uses more prayer beads than the rest of the world combined. And I did buy a nice (very large) rosary made out of rudraksha, as I found it interesting interreligious artifact. But perhaps it would be something worth revisiting when I return to the US. I just sent you an email with some questions. Did you receive it? I am working on gathering tools to be used in personal and corporate devotional prayer, and this booklet will be incredibly useful for introducing people to the concept of prayer beads. Thanks so much; I will be sure to cite you. Hi I just wantto know if it is logical for me to use prayer beads I am christian and I believe in the Trinity. I just think it would help me to focus on Prayer better. It is not biblical and the bible should be your final authority. The enemy has no desire for you to focus in prayer but your weapons of warfare are not carnal but mighty through God for the pulling down of strong holds. Enter His courts with thanksgiving and praise. Focus on all the Things He has done for you. When your heart n mind is full of thanksgiving there will be no other thoughts. Jesus was enough don't fall into false beliefs because sin is progressive. The next thing you know the devil was lead you to believe that you need a statues of Mary to help you focus in prayer. (the good news that Jesus is enough) is too precious a thing. You can either believe the Word of God that said Jesus loved you so much that He died for you and there is no other way to God but through Him. To believe anything else is a deception and pride to think your beads are needed. Read your bible and lean not to your own understanding. we walk by faith in God not how we feel A Gardner. Debra: thank you for your comments. I should like to point out that they are offered in a spirit that is significantly less than gracious and Christlike. I appreciate your zeal, but I find it to be less an appropriately measured holy zeal, and more of a Pharisaical legalism, aimed at rashly and fearfully restricting the freedom of those of us who have obtained the same life and liberty in Christ. This is something you may wish to prayerfully reflect upon. (cf. also Lk.6.45, 2 Tim. 2.24) Perhaps I am misreading the intended spirit of your note, but that is the way that your rhetoric comes across to me. Nevertheless, you do raise a number of good points and say a number of true things. Above all, first and foremost, let me affirm what you understand to be the heart of the Christian faith: Jesus loves us so much that He died for us on the Cross, and He is the only way to God. This is also what I believe; this is the truth upon which my life and my hope is founded. I have not, never have, and never will claim that prayer beads are necessary in any way. My only claim is that they have been useful in some Christian devotional contexts, and may be useful for some Christians in other contexts. If it is not helpful to you, by all means, ignore it! I would even affirm that is possible to abuse prayer beads. If we make it into a work that somehow gains merit with God, we have indeed "exchanged the truth for a lie." However, any external of the Christian life can be counterfeit. Even quoting Scripture and claiming to stand up for the True Faith can be an act of deceit — the devil quotes Scripture. (cf. Lk 4.9-11) But for me, and for (please God) for those who find and read this booklet, rooted in and an expression of true prayer rooted in the sacrifice of Christ, and an outcome of the new life that he has given us as His free gift. May God richly and graciously bless you. I do apologize if my writings may have seemed anything less than love and zeal for God and my fellow brothers and sisters in Christ. However, I live my life according to the word of God and consider the new testament the finished work. My zeal comes from seeing too many people lead astray into wrong thinking. I have seen many people live in guilt because they think their sins were so great that God could not forgive them but that is the result of prideful thinking given to them by the father of lies. If people did an indepth study on what our Lord really went through for our sins they would see that is a major insult to God to think that what He did was not enough. Pride said my sin is greater than His sacrifice. So, I am sorry if you think that is anything more than truth and deep concern for people who would be lead astray but no bead is needed and there is no mention of anything more needed for answered prayer. I wont post anything else about this. I have given truth and people have to choose for themselves if they choose to believe God or what man said. At the end of this life we will have to stand before God and explain why we choose to believe man made rules over His word and no one is going to get away with pointing their finger at someone else and say it was someone else fault. Thank you again for your response. I recognize that you are well-meaning, and you cling tenaciously to what is indeed the pure and unadulterated heart of truth: Jesus Christ and Him crucified. And to that truth, I have no qualifications to make, and nothing but my hearty assent to add. Certainly, “the fear of the Lord is the beginning of wisdom.” But in the spirit of fearing the Lord, do you not think it somewhat small to be afraid of how someone might be led astray by praying in this way or that way? Does God demand rigid ritual purity that excludes everything that is not mentioned in the Bible? If you think so, how would you justify that attitude Biblically? Far from it, I believe that if you argue that point, you have resurrected the Law that Christ died to free us from. See Romans 7; see 1 Cor. 8-10; for that matter, see all of Galatians. You would be right to suspect my teaching—and, indeed, fear for my soul—if I were unwilling to confess Jesus as Lord, or if I were trying to claim there were other ways to God besides Christ. I have said nothing of the sort; indeed, I vigorously denounce all such claims, and vigorously affirm Jesus is Lord, and is the Way, the Truth, and the Life, outside of whom no man can come to the Father. But does not Jesus say he will send His Spirit to us, and that His Spirit will lead us into all truth? If this is so, should we not then take seriously and honor all forms of piety that confess Jesus as Lord and Savior, even if they do not speak to us? Liberty in Christ means nothing if it does not also mean this: You are free to pray with beads – you are free to not pray with beads. Neither is he who prays with beads superior, nor he who does not. Only let all things be done to edification. I maintain that praying with beads can be edifying, just as any language of praise can be edifying. But it has value only inasmuch as it is taken captive and turned toward the glory, honor, and praise of Jesus Christ. Debra - obviously you have deep knowledge of the Word of God. Unfortunately you have the legalistic view that Christ warned us about in referring to the Pharisies. I pray a softening of your heart as you continue your walk of sanctification. Nathaniel - I have found your material very interesting. To dismiss something as advantageous to ones growth, just because it is not specifically mentioned in the text of the Bible is folly. I have recently found the use of prayer beads a useful tool to help bring a richer set of options to my worship. I continue to seek out more ways that others have found helpful in incorporation in personal and corporate worship. Thank you SO much for this wonderful resource. I am a professor of worship and teaching a class at my church for Lent about different spiritual practices, and am excited to include prayer facilitated by prayer beads in the practices we will study and engage in. Your booklet is tremendously helpful, especially with its historical and scriptural framing, and makes a great resource for teaching. As a protestant in a progressive church, I was very excited to find this resource to help my students and congregation members deepen their prayer practices. Many thanks!